When you look around, everyone got problems with their internet connectivity. Wi-Fi extenders come into play, whenever we talk about solving the dead spots homes and offices. They provide solid signal along the corners, across thick walls and even in the basements. Talking about the Ubiquiti AmpliFi HD, it’s the new addition to the growing list of the mesh Wi-Fi routers. It uses Ubiquiti router as a main hub while repeater are connected to main hub to extend the signals. The extender are connected to the Ubiquiti router, having same network name and password. This method of deploying Mesh routers has become very popular as its very easy to setup and can blanket the signal over the whole house. Ubiquite provides solid signal with a beautiful design. It’s one of the best mesh router out there in the market. Ubiquiti AmpliFi HD can be bought as a bundle, consisting of a router and extenders "Mesh HD Points". The Mesh HD points comes handy in extending the signals over the thick walls and corners. The whole package will cost you around 311$ while it can also be bought as a signal unit from the official website. 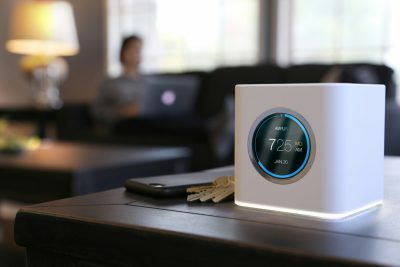 The signal router will cost you around 133$. Depending on the house, if you have a small house, then signal router or maybe a router and on mesh point will be enough but if you have a bigger house, you can add more mesh points. For large number of people, the bundle is more reliable and cost effective. If you want to get out the maximum of the market, you need to stand out of the crowd. AmpliFi HD has done that by developing a beautiful and great design. The design of the Ubiquiti AmplifiHD is so beautiful and unique. If give them an upper hand on all the other mesh routers in the market. Looking at the Ubiquiti mesh router. It’s a small white Cube, smaller enough that it can sit in the palm of your hand. At the front there is a digital display while at the back of the router are all the ports. It’s still good to see that mesh router has enough number of ports. Ubiquiti AmpliFi Hd has four gigabyte Ethernet ports for sharing the internet with different devices while on port for connecting your modem to the internet. Ubiquiti also a USB port for sharing printer and other storage devices across the network. Looking at the design of the Ubiquiti AmpliFi HD, they have already upped their game, this device look stunning and one of the best looking device. The design is so beautiful that you won’t have to hide them in the cupboard or windows. It will look perfect displayed on the window shelf or tables. Unlike all the others mesh routers, the Ubiquiti extenders are totally different in design to the Ubiquiti router. They are while oblongs which can be plugged direct into the switch. There is a magnetic ball in between that allows to set the angle of the extenders for better Wi-Fi signals. The design of the extender isn't that impressive as Ubiquiti AmplifiHD main router. They are quite big and doesn't match the understated design of the main router. If they were small like Ubiquiti main router, the whole package would be more beautiful and interesting. On plugging the AmplifiHD, it asks you to download the Ubiquiti AmplifiHD application for IOS or android, both the platform are supported. On the front there is a touch panel that can be used for more option taking you through a simple video and showing you how it can be set up. The app quickly find the Ubiquiti router and takes through simple steps, to set up the device. The well setup app with a touch display makes it on the most simple and interesting mesh router. People who doesn't like to toggle around with the setting. After setting, it’s time for a final test, how it performs. Even without the mesh points it performs very well and can be used in the basement, while adding the mesh points makes the signals more strong and solid. You can even stream the videos in the basements. Adding the mesh points are very simple, just plug them in the socket and after a few seconds, you will find them in you app. From them you will see the signal strength and also find the optimal place for deploying the mesh points for providing you with the better signals. Well, overall the Ubiquiti Mesh router is more than good enough. The design is beautiful, the performance is quite respectable, you can even Netflix in the next stories or basements. The price isn't that high and the setting up and toggling of the device is quite easy.